Few years back, I ate these cute little pillow-y filled pancake treats, in a Danish bakery, in Solvang. I came home, and craved to have'em one more time (at-least)! I was not an active blogger at that time, so never thought to try making some at home. What I did try though, was looking online for a Danish bakery, near-by. Instead of finding Danish Bakery, I came across this beautiful book by Kevin Crafts, and I couldn't help just staring at the pictures for a long time! Those were my pretty early days of blogging, when I bought two copies of this book, kept one for me and gave-away one on my blog. Then, I also received a few copies for more giveaways from author Kevin Crafts. I made a lot of ebelskivers since that time.... gave-away few books... but never thought my pictures worth to do justice to Kevin's recipes, until now. Now, after 3+ years of blogging, and improving 10-folds in my food-styling and camera skills, I finally felt to share one of my favorite recipe from his book i.e. 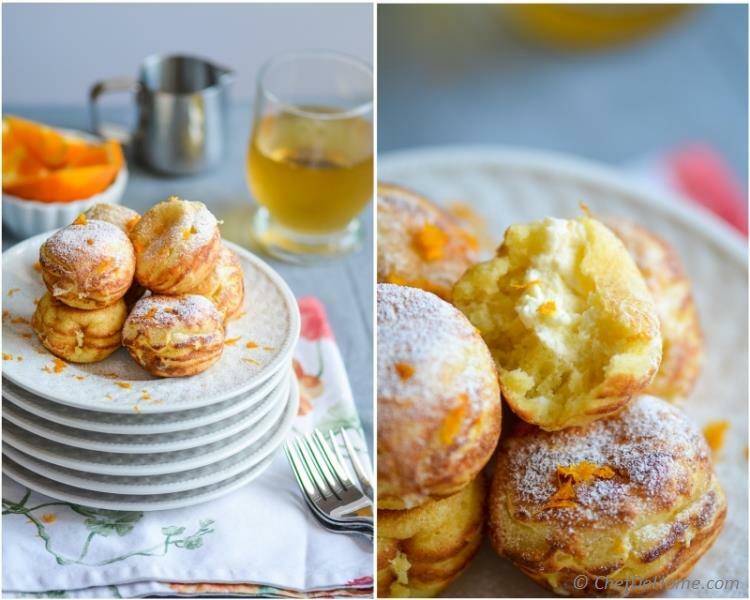 Orange-Cream Ebelskivers. 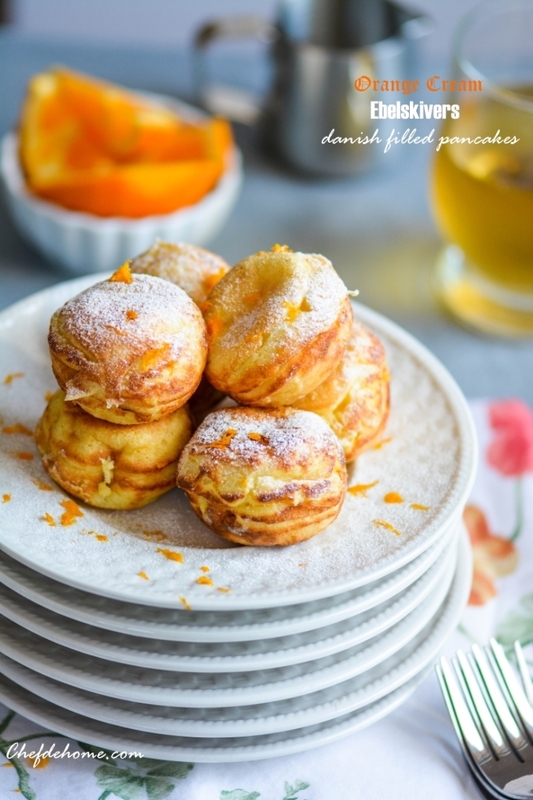 Pillow-y citrus pancakes filled with orange-cream cheese filling. Like a bundle of joy, these filled pancakes just melt-in-mouth. 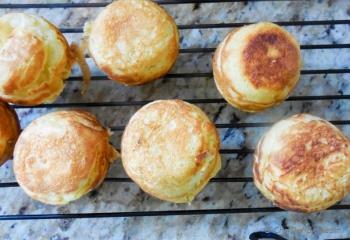 I often serve Ebelskivers for breakfast, especially these ones are our favorite with some hot Chai on Saturday morning. 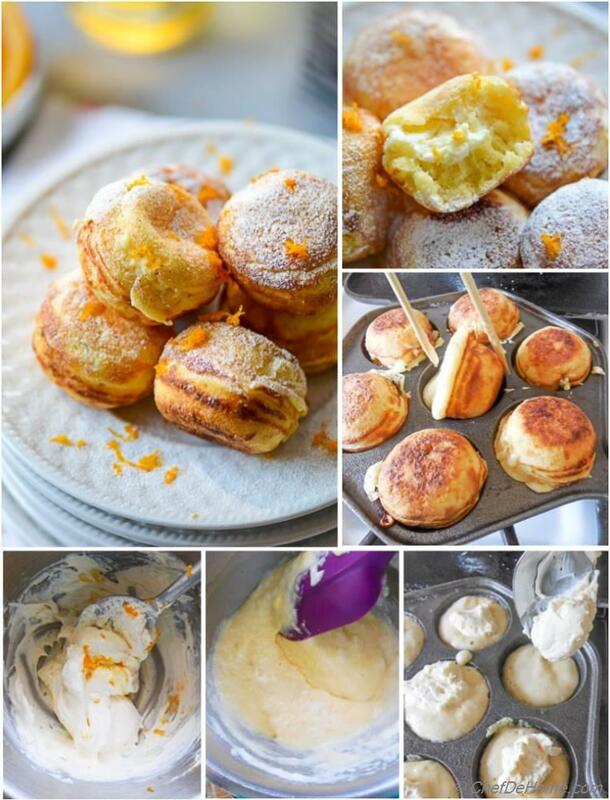 With this recipe, I am also announcing giveaway of another Ebelskivers Cookbook. Don't miss the chance to own this pancake cookbook with 40+ unique ebelskivers recipes. 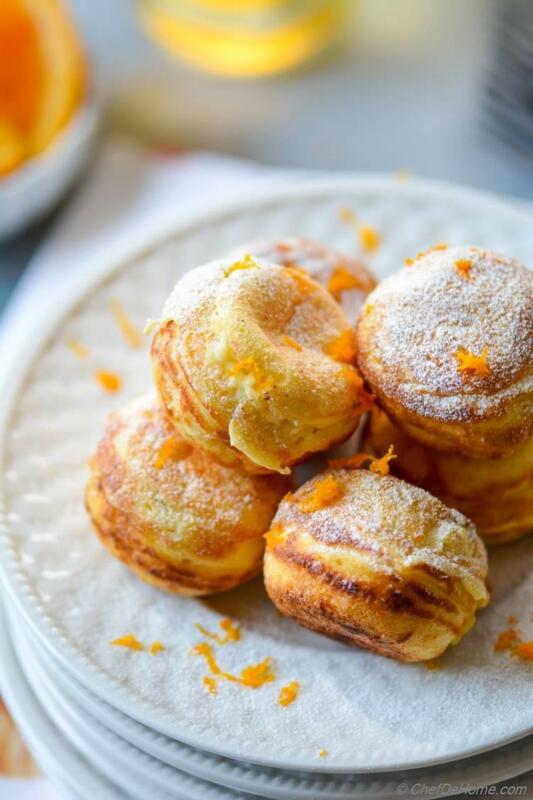 A great way to entertain during holidays, Kevin's Ebleskivers recipes are suitable for breakfast and dessert too. Book has collection of sweet, as well as savory Ebelskivers. What is your favorite flavor of pancake? and PIN this recipe to enter to win this GIVEAWAY. Happy pinning and get ready to make some Ebleskivers this Holiday Season! What is your favorite flavor of pancake? 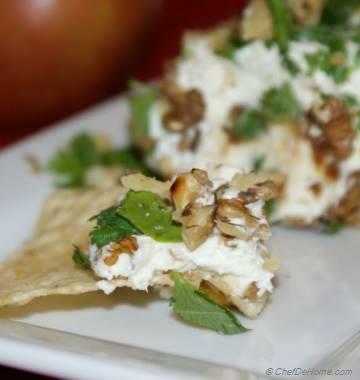 PIN this recipe, with #chefdehome #giveaway, mention in comment about pinning. To maximize your odds of winning, you can leave a comment every day. *No purchase required. Void where prohibited by law. Must be 18 or older to enter. Only valid for US residents. 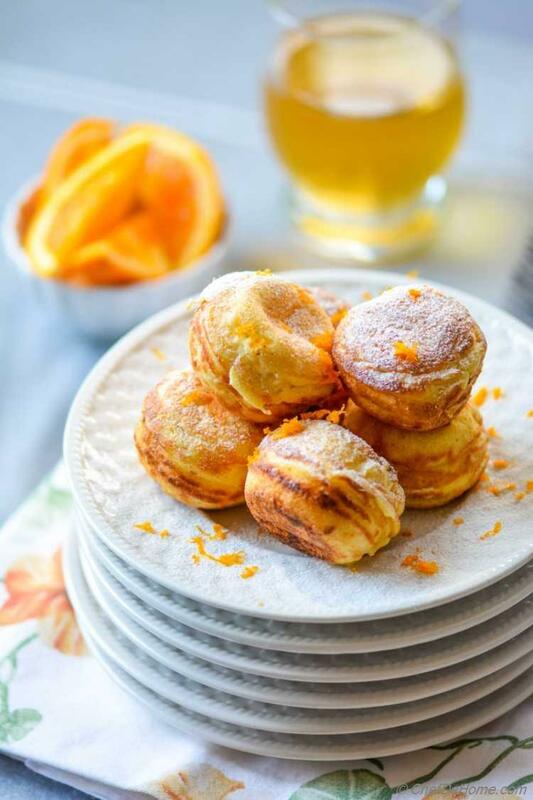 How about some Hot Chai with these scrumptious mini pancakes? Smart Swap Win giveaway and make 40+ variations of these pancakes. 1. 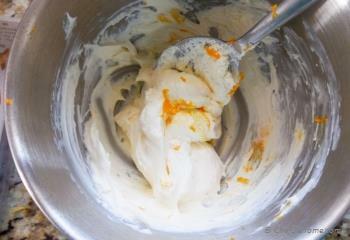 In bowl, blend cream with orange zest and 1 teaspoon sugar until smooth. Cover and refrigerate until needed. 2. Optional - Preheat the oven at 200 F to keep the ready ebleskivers warm while making more than one batch. 3. 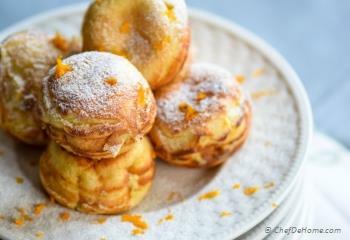 Orange Batter - In a large bowl, whisk together the flour, sugar, baking powder, and salt. Set aside. In a small bowl, whisk egg yolks, then whisk in the milk, orange juice, and melted butter. 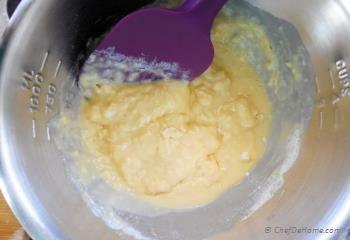 Add yolk mixture to flour mixture and, using spatula, stir until well blended. Batter will be lumpy. 4. 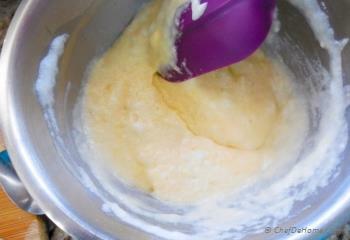 In a clean bowl, using electric mixture on high speed, beat the egg whites until, stiff but not dry, peaks form. Using a rubber spatula, fold about one-third of egg whites into the batter to lighten it, then fold in the rest just until no white streaks remain. Don't over-mix. 5. Brush the wells of ebelskiver pan with melted butter and place over medium heat. 6. When the batter starts to bubble, add about 1 tablespoon batter to each well. 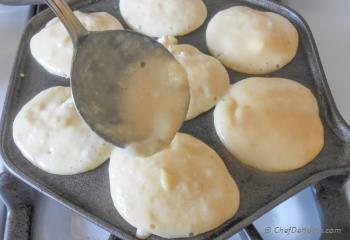 Working quickly, carefully spoon about 1 teaspoon orange-cream cheese mixture into the center of each pancake. 7. 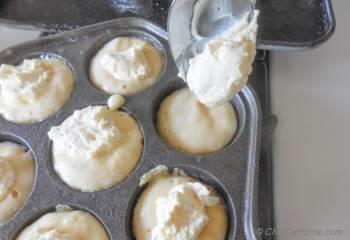 Top each with another 1 tablespoon batter. 8. Cook until the bottoms of pancakes are lightly browned and crisp 3-5 minutes. Use 2 short wooden skewers to turn all pancakes and cook until lightly browned on the second side. 9. Transfer the finished pancakes to a platter and keep warm in the oven while you repeat to make 2 more batches. 10. Dust warm ebelskivers with powdered sugar and serve right away. Ebelskivers require a Ebelskivers Pan for cooking. 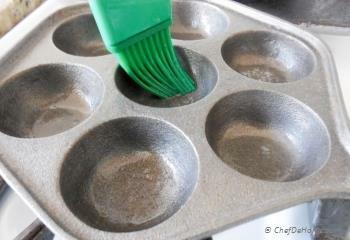 Pan should be hot when you add batter, so that batter does not stick to bottom of the pan. For first time cooking, I recommend filling only a few pancakes at-a-time to learn the skill of turning these pancakes properly. These look absolutely tempting... such a great post!!! @Donna Crawford, lemon and cherry sounds interesting to me! Can't wait to hear how you like orange-cream version. Happy cooking and thank you so much for stopping by! Thanks for Recipe. Just receive my first Ebelskiver Pan. Lemon and Cherry are my favorites so far. Will try this recipe next. Congrats!! Hetal @ Pretty Polymath, please claim your winning with in a week. Email chefs(at)chefdehome(dot)com with same email address you used to enter in the giveaway. Hey everyone! I am so sorry, my pinterest count is showing 0 pins where you all have pinned it, I know! It is some weird problem with pinterest which resets my pin count every other week. Giveaway is still ON and you all qualify. I will be announcing winner tmro. @dina, @Carolsue, thanks for participating! I've had these in Solvang, a Danish community here in California and they are SOOOOO good! i love blueberry pancakes. these look great too! @Ronda, @Leen Lily, @Shally Neil K, thank you so much! I am so excited to announce giveaway winner soon! Blueberry pancakes with maple syrup, always! pinning! I will definitely try these pancakes. 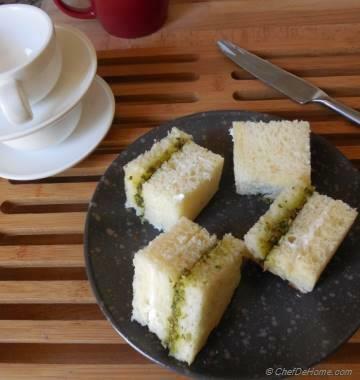 Thank you for sharing recipe. I love pancakes topped with fruit -- especially cherries, raspberries or blueberries! @Roomana, i doubt these pancakes can be baked. since need quick cooking, pan nd direct heat is suitable way to cook'em. 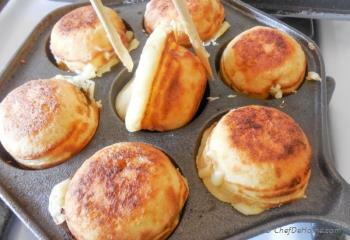 if u don't have ebelskiver pan, use normal pan with same batter to make filled round wide pancakes. hope this helps. Can we bake these pancakes? @Brenda, @Sol de Dezembro and @Nicoe, thank you so much for participating. @Nicoe, please PIN the recipe as well, I don't want you to miss the chance to win this cookbook. thanks. I can't get enough of pumpkin pancakes, especially this time of year! ! Cinamon Pancakes are my favorite! Pumpkin pancakes are my new favorite these days! 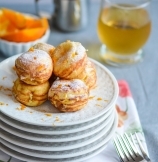 will love to try your recipe with orange and cream! yummy!! pinning! @Thalia and @Roomana, thank you! I love these Ebelskivers. It took me sometime to remember the spelling though. I will try them soon. Please keep updating. These little danish pancakes definitely take me back to when I travelled through Europe. 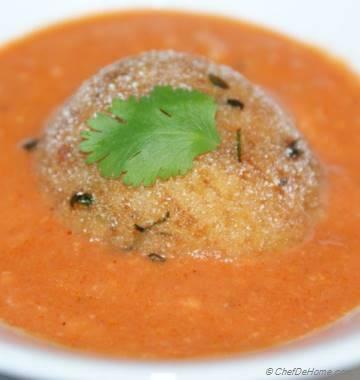 Great recipe, definitely one I need to recreate! Love all the pics. Great clicks! Blueberry pancakes are my favorite. These orange cream ones I want to try soon. pinning!